Buffalo Soldier & officer. In 1890 awarded Medal of Honor. His long career exemplified struggles of black soldiers of the era. William McBryar was the only enlisted member of the 10th Cavalry to receive the Medal of Honor prior to the Spanish-American War. He was the second African-American from North Carolina to be so honored. Born in Elizabethtown, he enlisted in the army in New York in 1887. Older than most recruits, he was better educated, having completed three years of college. He joined Company K at Fort Grant, Arizona, following the 1886 capture of Geronimo; his outfit spent much of 1887 pursuing an Apache guerilla named "Kid." The following year McBryar suffered abdominal injuries when a horse fell on him. McBryar remained in the army, serving during the Spanish-American War with the 25th Infantry in Cuba. There he commanded a platoon, since his company lacking commissioned officers. He was commended for leadership in what was a pivotal battle in the campaign. McBryar received a commission in 1898 and was sent to Fort Thomas, Kentucky, as a lieutenant in the 8th Volunteer Infantry. When his unit was mustered out in 1899, McBryar reenlisted as a private and went to fight in the Philippines, becoming a quartermaster and first lieutenant. 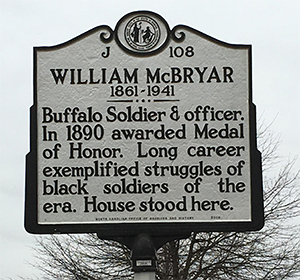 For years McBryar tried to become a regular commissioned officer, and was supported by his white commanders who considered him competent and intelligent. However, in 1901 after fourteen years of service, McBryar’s unit was mustered out and he found himself at the bottom of the ladder once again. He rejoined the Buffalo Soldiers as a private in 1905, but due to rheumatism, was discharged a year later, and moved to Greensboro. McBryar tried civilian careers including farmer, military school instructor, and watchman at Arlington Cemetery. During World War I, he again tried to reenter the Army. He died in 1941 and was buried at Arlington National Cemetery. Photograph of William McBryar. The Hall of Valor Project. https://valor.militarytimes.com/hero/3161 (accessed July 25, 2018). National Museum of African American History, Smithsonian Institution. "Buffalo Soldiers." https://nmaahc.si.edu/explore/manylenses/buffalosoldiers (accessed July 25, 2018). North Carolina Highway Historical Marker Program. "William McBryar." Photograph. http://ncmarkers.com/marker_photo.aspx?sf=a&id=J-108 (accessed July 25, 2018).